Longer days, warmer weather and spring flowers have us longing to be outdoors. Whether it’s time to update an existing deck or create an inviting new one, there are many options available in deck styles you can personalize to meet your taste, lifestyle, and property. 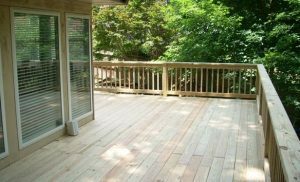 Adding a deck can add value to your home-expanding your living space. It can also provide a transition between the interior and exterior of your home, creating a private sanctuary, or converting your yard into a favorite entertaining venue. Attached to your home, this style of deck provides additional living space for entertaining and a seamless connection to the outdoors. 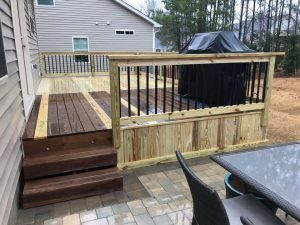 Is it time to extend or redesign your existing deck to accommodate more friends and family or add new features like a kitchen space, pergola, or seating? A detached deck can redefine your yard. Create a favorite destination spot in a shady space, or a prime location with a view. Wrap it around a fire pit or hot tub, add a screened room, or provide a natural extension and design element for your garden landscape. Platform decks are often low to the ground and are perfect for benches, planters and pergolas. A wraparound deck is a great space-saver for smaller yards while allowing for a variety of access points, views, lighting and function. Wrap around your master bedroom and create a secluded getaway or add rockers for cozy porch-sitting. On larger properties with changes in elevation, a multi-level deck is perfect. 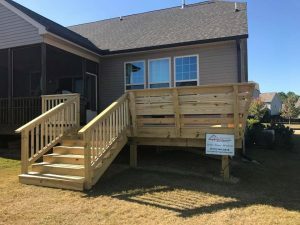 Connected by steps and pathways, a multi-tiered deck can provide well-defined spaces for lounging in the sun, dining, and relaxing in the shade. Typically slip-resistant, a pool deck follows the contours of your above ground pool providing easy access and a great place for friends and family to dive in, lounge poolside, and keep an eye on younger swimmers. Complimenting the architectural design of your home, entryway decks form a series of pathways, steps and platforms leading to your house’s entrance or front courtyard deck. Add further design elements like benches, planters and special lighting to welcome your visitors. Too many bugs to enjoy the North Carolina summer evenings outside? Screened decks provide the perfect solution. Create a prime outdoor three-season retreat by adding ceiling fans, lights and a fireplace. Inspired? Improve your outdoor living space today! Call us at 919-346-0678.